Shriners Hospitals for Children is a member of the Mayo Clinic Care Network, a national network of organizations committed to better serving patients and their families through physician collaboration. 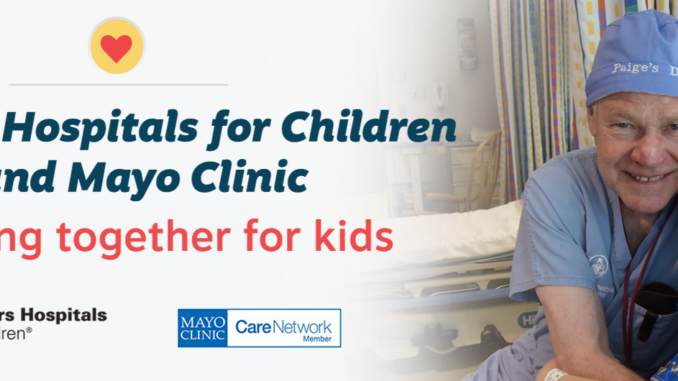 Mayo Clinic and Shriners Hospitals for Children have a similar mission of providing the best care to every patient through integrated clinical practice, education and research. The network allows Shriners Hospitals for Children to offer providers and patients convenient access to additional expertise from Mayo Clinic. The relationship enhances the delivery of local care and promotes peace of mind as providers, families and patients make health care decisions. Tools and services available through the Mayo Clinic Care Network include eConsults and AskMayo Expert, among others. Through the network, Shriners Hospitals for Children physicians can easily consult directly with Mayo Clinic specialists and subspecialists to ask questions about a patient’s care. The consultation is provided at no additional cost to the patient and is documented in the patient’s medical record. Members also have access to an extensive library of patient education materials and physician and scientist grand rounds conferences. The Mayo Clinic Care Network represents non-ownership relationships. Shriners Hospitals for Children and other members of the network remain independent and share a commitment to improve the quality and delivery of health care. The network, launched in 2011, now has more than 40 member organizations and a reach that extends across the United States and includes locations in Mexico, Philippines, Singapore and the United Arab Emirates.